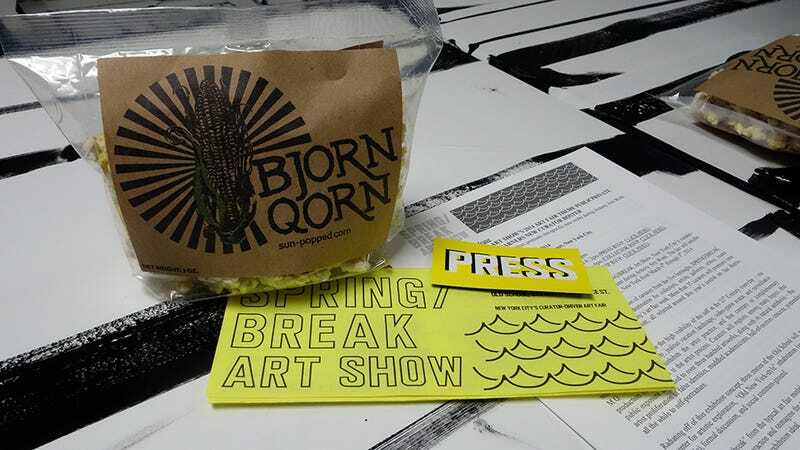 It's spring break in NYC and instead of busting out our Day-Glo ski masks and bikinis, we popped by the opening day press preview for the third annual SPRING/BREAK art show to visit our friends Sarah Bereza and Will Bates of Fall On Your Sword. They debuted a piece called "Private Drive-In," an interactive installation that involves an original VW Bug with vibrating seats, movie make-out projections, and intense soundscapes. Photo by Justin Cross – shot on a Sony QX100. The exhibition, put together by a group of 40 hand-selected curators, opened yesterday at The Old School — a legitimately old Little Italy/SoHo school built in 1825-26 as a Roman Catholic orphanage that then became NYC's first parochial school. The structure is eerie, dilapidated and perfectly suited for a multimedia art show exploring public and private concepts of self in the 21st century. We took an hour out of our workdays to spin through the space. We saw a live game show in the basement (and snagged some free popcorn and Perrier), canned goods in perfect rows in an idyllic white-picket-fence/green-grass environment, curtains made from paint can lids, hair-only portraits of celebrities, and a ton more. And that was only two levels of the four. Check out some of what we saw yesterday, and if you can, swing by The Old School from now until Sunday (March 9) to see the incredibly varied and stimulating pieces for yourself.